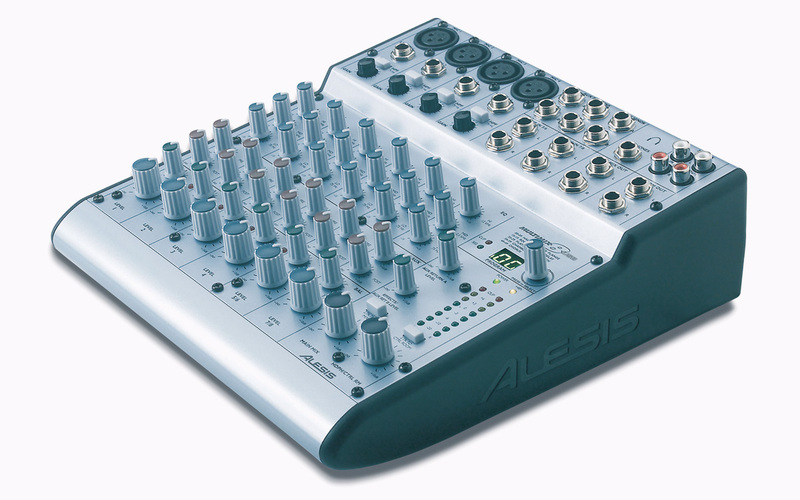 Available in 8–channel and 16–channel configurations, these compact tabletop mixers feature USB connectivity, low–noise analog electronics, 100 studio–grade 28–bit digital effects, and rock–solid construction. Whether used for mobile or studio recording, MultiMix USB Mixers get the job done right. CONTROL Front-panel channels (top down): 4 mic/line channels with 75Hz highpass filter switch and mic/line gain. All channels with 3-band EQ (high shelving at 12kHz, mid bandpass/reject at 2.5kHz, low shelving at 80Hz) aux send A (pre-fader) aux send B (post-fader, onboard or external effects) pan or balance level. Front-panel other: Effect section with selector plus clip and signal LEDs. Aux return A level, effects/aux return B level. Main out level with 2-track to mix switch. Headphone/control room out level with 2-track to control room switch. Stereo 8-segment LED meters. CONNECTIONS USB 1.1 Stereo input/Output for PC (Windows XP or Vista) and Mac (OS X). All 1/4" TRS except as noted: Mic in x 4 (XLR), mono line in x 4, stereo line in x 4, aux sends x 2, stereo aux returns x 2, stereo main out, stereo control room out, headphone out. 2-track stereo in and out (RCA).